Dental decay happens to just about everyone eventually. It’s just a part of getting older, with a whopping 91 percent of adults between ages 20 and 64 experiencing some sort of tooth breakdown, from tooth decay to cavities. The scary part is that studies have shown up to 27 percent of those people could have untreated tooth decay. Not treating tooth decay — and avoiding dental exams — only leads to more pain and discomfort and an even further decline in mouth health. Cavities and gum disease are preventable to a certain extent. Getting dental exams twice per year is one of the best ways to ensure that your daily oral hygiene habits are healthy. If your dentist notices some signs of cavities or gum disease, he/she can give you recommendations for how to change your habits and improve your mouth health. Research shows that there’s a link between your mouth health and your overall health. For example, gum problems — bleeding, sensitivity — have been found to be linked to heart disease, bacterial pneumonia or stroke. 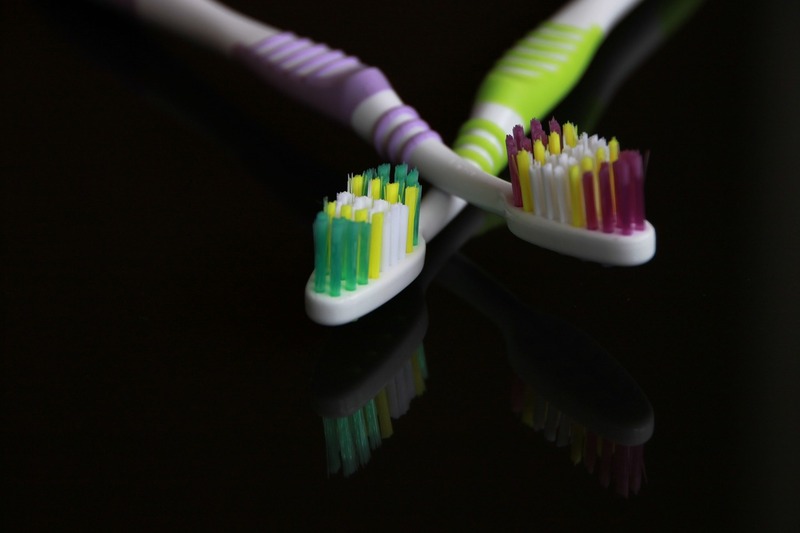 When you brush your teeth at home, you’re removing plaque, which is great! When you get your teeth cleaned during a dental exam, however, they’re removing the tartar from just above and below your gum lines and scrubbing away stains. The frequency of dental exams depends on your mouth health. For the most part, twice per year is the golden rule. If you have a healthy mouth, then once a year is probably fine. If you use tobacco, currently have gum disease or are pregnant, you may need to go more often than twice per year. And hey, your frequency could change depending on the state of your health. Ask your dentist what he or she recommends. Here are some signs that you should see a dentist as soon as possible. 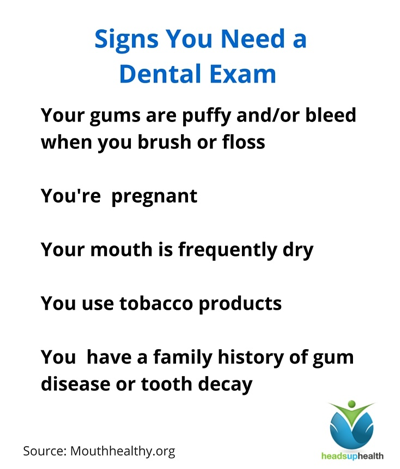 If one or more of these apply to you, make a dental exam appointment today. Navigate to the “Profile” section and scroll to the tile for “Routine Screenings.” Then add the date of your last dental exam. Important: Be sure to also upload a copy of your dental exam into the “File” section. If you have a disease that could be related to or impact your mouth health, you’ll want to share your dental records with your primary care physician or specialist. If you’re ready to add your last dental exam date and record to Heads Up Health, head over to our website and get started. Or if you just want the latest from Heads Up Health, follow us on Facebook or Twitter. Questions? Shoot us an email. We’re here to help!